Some nodes need to share configuration. 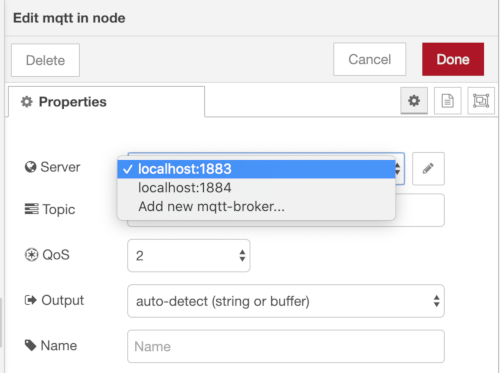 For example, the MQTT In and MQTT Out nodes share the configuration of the MQTT broker, allowing them to pool the connection. Configuration nodes are scoped globally by default, this means the state will be shared between flows. In this example, the node acts as a simple container for the configuration - it has no actual runtime behaviour. A common use of config nodes is to represent a shared connection to a remote system. In that instance, the config node may also be responsible for creating the connection and making it available to the nodes that use the config node. In such cases, the config node should also handle the close event to disconnect when the node is stopped. Nodes register their use of config nodes by adding a property to the defaults array with the type attribute set to the type of the config node. As with other properties, the editor looks for an <input> in the edit template with an id of node-input-<propertyname>. Unlike other properties, the editor replaces this <input> element with a <select> element populated with the available instances of the config node, along with a button to open the config node edit dialog. The node can then use this property to access the config node within the runtime.